Results showed that laboratory mice treated with the decoction of “tawa-tawa” had an increase in platelet count, reduced bleeding time and decreased blood clotting time. Based on the results, researchers concluded that administering tawa-tawa decoction to animal models help improve their healing mechanism. Euphorbia hirta or popularly known in the Philippines as “Tawa-tawa” or “gatas-gatas,” is a hairy herb that just resides in the backyard, roadsides and pathways. This common weed – tawa-tawa – is claimed to have healing properties on dengue patients as being backed up by personal testimonies, it became one of the most popular “folkloric medicine” for dengue in the Philippines. 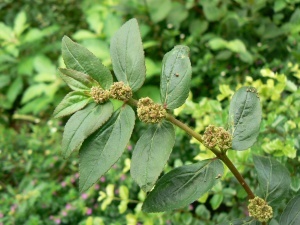 As a folkloric treatment in the Philippines for dengue, tawa-tawa has earned many anecdotal testimonies from those who purportedly became well from the plant’s concoction: its leaves boiled like a tea and taken orally. In preparing tawa-tawa tea, 100 grams of the fresh whole plant (including roots) are washed and boiled in half a liter (500 ml) of water for 15 minutes. After cooling and paper-filtration, the decoction is taken by the patient at one glass every hour until the fever subsides. just proven, a wk ago my son was diagnosed with dengue, for 3 days his platelet deteriorate, on the 4th day it really goes up and he was not confined anymore, now his fine and ok.tnx God. But, why is it that until now, snakeweed is not yet approved by the DOH knowing the fact that it has a healing power? Great question – I'd like to know that too. Is dried tawa tawa effective? and if so, how much to prepare? Tawa tawa is really amazing… It really cures dengue! My niece already tried it and its really effective. Is this process equally effective using powdered form? Great! Many will be benefited with this research.